As businesses and healthcare providers look for ways to both better engage and service their clientele, one aspect of communications technology that is worthy of closer examination in this context is Text Messaging (SMS) as an important and integral part of the bill payment process. Datatel recently conducted an in-depth analysis that focused on the healthcare and insurance industries. We looked specifically at the behavior of customers (Insurance) and patients (Healthcare) when making payments by phone (calling in to an Automated IVR Payments line) and when they were provided with the option to receive a confirmation of payment directly to their mobile phone via Text Messaging (SMS). The results do indicate that this is an option that is growing significantly in acceptance and this provides businesses with an opportunity to offer their clientele with an enhanced and more valuable caller experience and to engage with them in order to get feedback that they can apply in order to continue to improve in various areas of their operations. 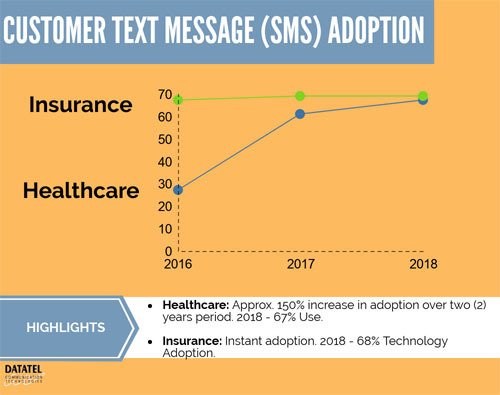 In the healthcare field for example when providers offered text messaging as part of the pay-by-phone experience, in 2016 27% of patients opted in – by 2018 67% were opting to receive them, a nearly 150% increase in just two (2) years. With regards to insurance, the results were similar. 69% of customers that were offered the option to receive a payment confirmation directly to their mobile phone via Text Messaging. What are the implications of this and what does it mean for businesses? Given the rapid growth in the acceptance of this option when it’s offered, it strongly suggests that customers want service providers to adopt communication channels that are convenient to them and make the process of bill paying easier and more fluid. Moreover, it also suggests that it’s worthwhile to invest in payment and communication technologies which customers are willing to use. So, for customers who use automated pay by phone services for bill paying the advantages of receiving a text receipt are convenience and ease of interaction. What are the advantages for businesses (aside from offering technology options that their customers find convenient)? For starters, given that customers have indicated resoundingly that they are favorably disposed to engaging with SMS, businesses can then deploy the technology in other ways for both their and their customer’s mutual benefit. For example, in addition to using Text Messaging for receipts, what about using it to remind customers of upcoming payments that are due? By implementing text message reminders in to an algorithmic driven collections communication, businesses and organizations can help improve collections and reduce outstanding receivables, while maintaining positive customer relations. The customer may very well appreciate the reminder and it is pre-emptive rather than waiting for the account to become past due. Bottom line, if you are already using or considering using Automated Pay by Phone / IVR Payment technology, then TXT messaging is an already accepted extension of this form of bill payment. It’s also an opportunity for businesses and healthcare providers to maintain a channel of communication with their customers that is customer accepted.